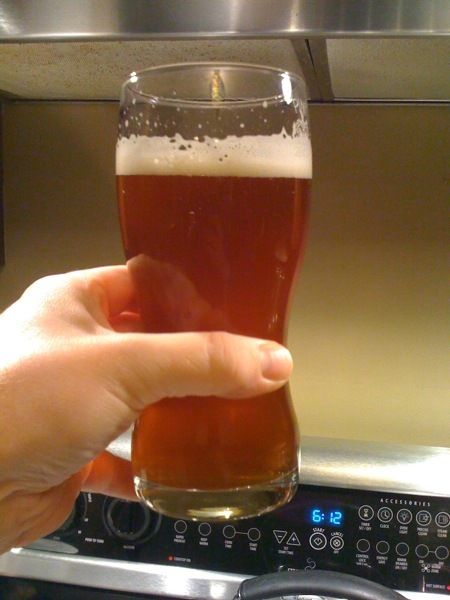 This is the story of how I decided to brew a clone of daisy cutter pale ale, and my plans hone the recipe. It’s been a while since I’ve brewed at home and it feels longer since I’ve brewed a good hoppy beer. I’ve felt either rushed, distracted, or otherwise I screwed up my last few batches. Coincidence or not, I also haven’t brewed a really hoppy pale ale in some time. I won’t go into the details here, I’ve already shared one failure on Facebook. Lets just say I could really use a win. Early this year I decided I was going to try to dial in my brewing, calling it the year of calibration. I am trying to both harden my brewing process, and add process controls. That way I can know how specifically I brewed a beer, which will allow me to reproduce success, and improve upon the beer in future batches. I haven’t been terribly consistent with either process or equipment in my last few batches. I think I’ve made my last major changes for a while, and my hope is that I can take this beer, evaluate it, access the recipe and brewing process, then brew it again making only slight changes to the process. What better way to brew a good beer than with an unproven recipe. I first had Daisy Cutter from Half Acre Brewing company on a business trip in the fall of 2010. It was very enjoyable, but only available in the greater Chicago area. So, I decided to ask the head brewer Matt Gallagher for some tips on brewing a clone and he was very gracious to share recipe details with me. With those details in mind, I was able to design this recipe. I used brewers friend to predict and adjust mash ph with acid malt. I wrote a big brew plan down with all of the details, what to bring up, times and temps, volumes, etc. I double checked my recipe. I checked my mash schedule and temps, I checked my water volumes, and hop additions. One of the goals brewing this batch was to not be rushed into a mistake. I frequently try to squeeze in a brew night when I don’t have the time. It causes me to make mistakes, like forgetting to include 1/2 my grain bill, rushing sparging, and skipping important measurements. This time I gave myself enough lead time to make it work. I measured my grains, and hops. I set the gap on my grain mill. I brought up a majority of my brewing gear. I made my yeast starter. I calibrated my beer bug. I filtered my water. I calibrated my thermometers. 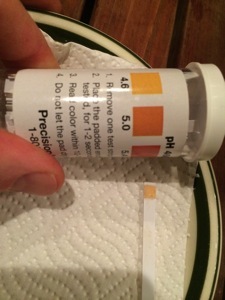 I measured the ph of my filtered water. I ran an issue when trying to mill my grain. I loaded the hopper before turning it on, jamming it, and it spun one of the pulleys. My attempts to clear it failed, and I had to disassemble the mill and adjust my rollers. Eventually I was able to mill all my grain for this recipe. I was able to accomplish all of this well before brew time, and I was as ready to brew as I could be. My brew night got off to a good, but late start at around 9:15 pm. I took a final milled grain temp and mash tun temp and plugged them into BeerSmith to get my target strike temp. I set the chef alarm to warn me when strike water got to temp while I finished my final preperations. Just as my friend showed up to supervise / distract / chat it was time to mash in. As I added the grain he stirred vigorously. A few readings later and I was reading 153/154. A little higher than I intended, but shouldn’t be too bad. I took mash ph, about 20 minutes too late. The strips read between 4.6/5.0, which is to be expected according to Kai’s summary, which puts mash ph around 5.1 ish. I took a conversion test at about 50 minutes and it looked fully converted. I added a half gallon of 170* water for the first batch, and cracked the handle on the ball valve to gather my first runnings and nothing came out. I tried blowing out the line, I tried adding extra hot water and nothing was working. I thought about adding rice hulls, but I didn’t have any. I had to resort to transferring the mash to my polarware boil kettle with false bottom to lauter the mash. Before transferring the mash, I added the rest of the mash water, then added the mash. I was hoping to float some of the mash to prevent the grain from being forced into the false bottom. After transferring, I let the it settle for 20 minutes before trying to run off. It ran fine, and I managed to collect a bit more than my desired run off, and I was slightly under my expected pre boil gravity (1.038). Not terrible, but, could have been better. Once ran off and on the heat, it was getting quite late, my friend called it a night, boil finally arrived at 12:47am. Boil was uneventful. I chilled to somewhere near 190, and added my whirlpool hops in a hop bag. I once again had a chef alarm probe failure, and I’m unsure exactly how low the temp got before I realized the probe was acting flaky. I did let it set 15/20 minutes at the slightly chilled temperature. Then removed the hops and chilled well beyond pitching temp to 54. I pulled a sample and took gravity 1.048. This matched my refractometer at the end of boil. I removed my immersion chiller, whirl pooled the kettle with my spoon, then allowed it to settle another 20 minutes. At that point I transferred a full 3 gallons to my carboy. It was too much actually and I needed to dump a little bit to make room for my yeast starter. I then hit it with 15 seconds of pure 02. I put my carboy into a water bath set at 64, and put my beer bug on the carboy, leveled the beer bug, then called it a brew night. When all was said and done it was 3am. When I checked the beer’s logging progress the next morning, I saw some erratic logging. When I checked on the carboy in the basement, it was already bubbling away. It was nearing blow off so had to swap to a blow off tube. Over the course of fermentation, using the beer bug I watched my gravity. When it was stable for a two days at 1.013 I transferred to dry hop. 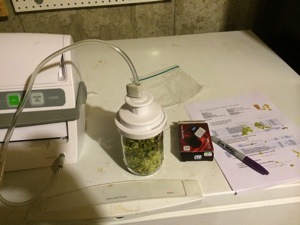 I was able to transfer the beer under gas, using a carboy cap, a male mfl, and my co2 tank. This is something new I tried, so I can avoid exposing the beer to oxygen. I’m planning on dry hopping the beer for at least 4, but no more than 5 days. I expect to be able to pour this beer in about 15 days, and I can’t wait to see how it is. The fermenter sample was a lacking in hop flavor that I was really hoping to see. While I don’t have a glass of this in my hand yet, these are my initial plans for next time. Send off my ward labs water test. Identify water additions to make my hop flavor pop. Start the mill first, then add grains. Use a BIAB bag in the mash tun. Avoid submerging the chefalarm probe into the mash tun / boil kettle. Use the blow off tube from the start. I don’t have any recipe changes planned yet, It will depend on the feed back I’m able to solicit from my peers. Printing my recipe, check list, and brewing plan, and using a clipboard. Use the chef alarm to warn me when strike water is approaching temp. Estimating mash ph using brewers friend. Using a bag for whirlpool hops made cleaning up / running off much easier. 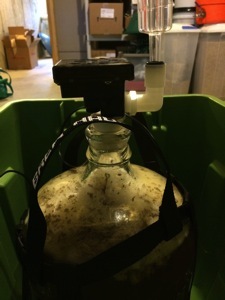 Monitoring fermentation using the Beer Bug. Updated 4/26 to include recipe, and recipe notes from brewer.